Apologetics.com > Uncategorized > Resurrection: Real? Or Real Dumb? Paul is pretty clear in 1 Corinthians 15. If Jesus did not rise from the dead then our preaching is in vain, our faith is in vain, we are misrepresenting God, our faith is futile, we are still in our sins, and we are the most to be pitied. Verse 32 even says, “If the dead are not raised, ‘Let us eat and drink, for tomorrow we die. '” Those are some very strong words! However, if Jesus did rise from the dead, then it changes everything. That is why answering the question as to the truth of the resurrection is probably the most important thing we can do aside from putting our trust in Jesus. “Resurrection: Real? Or Real Dumb?” is designed to help people see that the resurrection is real and that we should put our trust in Jesus. It really does make the most sense when looking at all of the possible explanations compared to the evidence as you see here. So, I encourage you to watch the talk and decide for yourself which explanation makes the most sense. 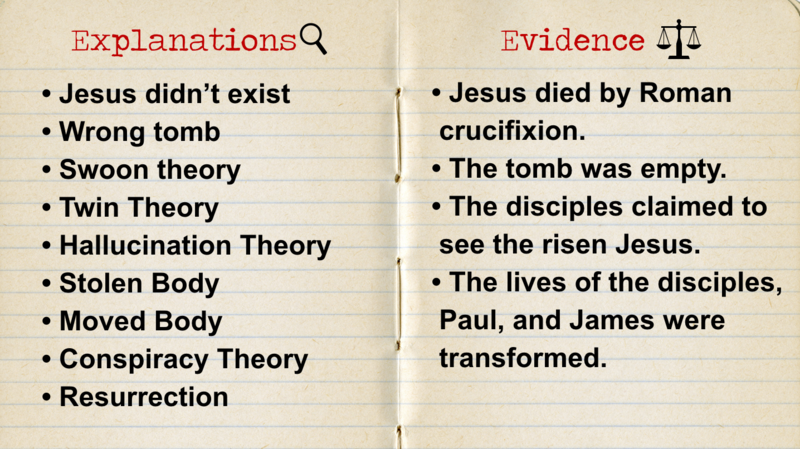 If you are looking for more resources, evidence, or objections to what was mentioned here, check out my Easter Resource. If you are interested in having me speak at your church, camp, or youth group, click on the Endorsements & Speaking page to see my list of topics and contact me at Speaking Requests and email me at contact@coffeehousequestions.com. You can select a topic from the list or suggest your own. I am happy to help in any way I can. God bless!